Has Dun Laoghaire Lost the Plot? 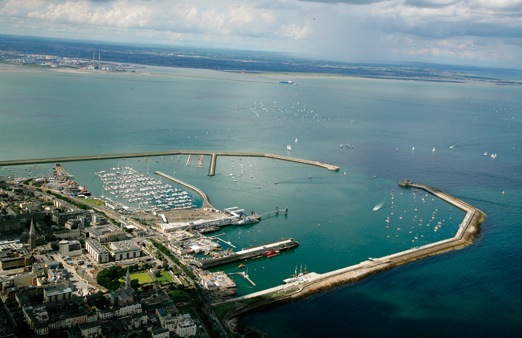 #dlharbour – Dun Laoghaire's waterfront area and harbour is a hotbed of development and proposed projects. W M Nixon takes an outsider's view of what might be happening around Ireland's biggest sailing centre. Your heart would go out to Dun Laoghaire. The perceptions which emerge from proposals for developments and new businesses along the waterfront definitely don't chime at all with the image of a place which once was known as Kingstown, and has its origins in the heights of gentility and middle class refinement. What are we folk from other ports to make of it all? We find sailing in through the entrance to savour Dun Laoghaire harbour's unique style a wonderful experience. There is nowhere quite like it, not just in Ireland, but anywhere else in the world. Yet rumours fly around about changes which could seriously impair the special character of the place. What are those of us who may not have the inside track on the true nature of actual and anticipated developments along the waterfront to make of it all? Not to pull the punches, it seems that the Dun Laoghaire waterfront area is going to have an enlarged halting site for the Travelling community down towards the west pier. It's going to have an "urban beach" resort amenity for the sort of people who use such places within the harbour on the inner end of the east pier, thereby blocking off a very useful berthing space. And it's going to have the Dublin area's first Wetherspoon's super-pub right bang in the middle of the harbourside. Set against Dun Laoghaire history and the elegant appearance of its better buildings, this would all seem bad enough. But that is to ignore the most enormous elephant in the room. This is the new public library, which has been put up with astonishing speed to block out much of the sea view from the Royal Marine Hotel. It towers over the entire waterfront with a prow which suggests that at last Ireland has her first aircraft carrier. But unfortunately for any strategic purposes and rapid peace-keeping in distant parts of the world, it happens to be very landbound in the midst of mostly pleasant smaller buildings which now seem utterly dwarfed. It would indeed be wonderful if it were an aircraft carrier and could put to sea and leave the town to nurture something of its own true character. But instead we have to learn to live with it while wondering what it's all about, though in fairness it should be mentioned that the first notions of it were to provide a structure to match the sky-scraping Daniel Liebeskind building (remember that?) which once upon a time was planned for the Carlisle Pier just across the way. But if this is indeed a public library, then we can only conclude that the good people of Dun Laoghaire must do an awful lot of reading, for it's HUGE. And we can only fear that if they read with the assiduity this building suggests, then they'll have neither time nor energy for anything else, not even the seagoing pursuits which the possession of one of the finest artificial harbours in the world should encourage. From Dun Laoghaire's traditional promenading area of the East Pier, the new library building towers in particular over the National Yacht Club. Of course, if you're in that most hospitable club and looking out to sea, you're blissfully unaware of this enormous presence behind you. But the effect on people coming in from seaward is distinctly oppressive - it's like that giant black space craft which hovered over New York in the movie Independence Day. Dun Laoghaire in the rare ould times, when you'd a real sea view from the Royal Marine Hotel, and from the pier could admire that splendid establishment in all its glory. Photo courtesy NYC. Until this thing appeared, there were still some relics of ould decency and architectural harmony along the Dun Laoghaire waterfront and the streets immediately behind it. Any significant building is a statement in itself, so we're entitled to look at buildings as they are, and respond to them. The central gem of the waterfront is the railway station, designed by John Skipton Mulvany. It's a perfect little jewel of neo-classical design, and to my mind makes a much pleasanter architectural statement than that other exercise in classical work, the Casino at Marino, which was fussily built as an architectural exercise, whereas Dun Laoghaire station is both functional and beautiful, well fulfilling its contemporary role as a stylish restaurant. Dun Laoghaire did very well out of John Skipton Mulvany, as in 1851 he created the design for the Royal Irish Yacht Club building. In terms of Irish history, few buildings are so significant in the very fact and timing of their construction. Originally founded in 1831, the Royal Irish had been overshadowed by its brasher younger sister, the Royal St George YC founded 1838. While the George developed rapidly as the exclusive preserve of the land-owning classes and the most prosperous Protestant business magnates – the offspring of Cromwellian land-grabbers and the Jamesons and Guinnesses, in other words – the RIYC, as a club with some of the older traditions in its makeup, went into a decline which was accelerated by the grievous effects of the Great Famine from 1845 onwards. Thus when a meeting of several RIYC members – their numbers including Daniel O'Connell the Liberator - was held in a Dublin hotel on 4th July 1846 (American Independence Day by design, one presumes), it was in the hope that the club could be revived as an expression of faith in the future, and they agreed that a new landmark building on the waterfront would be the key to this. So in responding to the RIYC's impressive neo-classical pavilion on the harbour, we are looking at both the world's first complete purpose-built yacht club house, and the very symbol of a nation beginning the long road to recovery from both the Famine and centuries of conquest and despoliation. Along the waterfront, the Royal St George clubhouse by contrast was built through frequent expansions, but as Mulvany was also involved in some of the stages, it has a fine sense of completeness despite its several creators in different eras. Facing up to the challenge of matching these two classical buildings on the waterfront to the west was clearly an insuperable task, so when the National Yacht Club came into being as the Edward Yacht Club in 1870, it went for a much more under-stated architectural style. There's something attractively of the shooting and fishing lodge of the west of Ireland about it, it seems modest by comparison with the other two clubhouses, yet it's surprisingly roomy and stylish within. All three of the big waterfront clubhouses are immaculately maintained and each brings its own injection of vitality – and substantial employment – to Dun Laoghaire. And the town in turn has developed in concert with the growth of maritime activity, and the increased communication with Dublin brought about by the historic railway (which was opened in 1834) and frequent road improvements, while summertime excursion steamers sailed to the harbour from Dublin port. Some would compare the stylish seaside town for Dublin which tried to develop at Dun Laoghaire with Brighton in its relationship with London. But Brighton was purely a seaside resort in which the recent marina is an add-on, it's not a harbour which is central to the place. Dun Laoghaire by contrast is all about the harbour. There was virtually nothing there until this vast asylum and ferry harbour for large vessels (that was its sole original purpose) was built on a totally empty bit of coastline eastward of the old Dunleary harbour, a shallow tidal inlet which it enclosed and whose existence is remembered in the area's local name The Gut. The coast at Dun Laoghaire before the harbour was built. The harbour of Old Dunleary, in the area still known as The Gut, was a shallow creek in the southwest corner of the new harbour. The first regatta in the new harbour was sailed on July 22nd 1828, and was won by Liberty (on right, 39 tons, owner Lord Errol) from Medora (45 tons, owner Mr Kelly). The Royal Irish YC emerged in 1831 from this event. Thus it may be stretching it a bit, but the most telling comparison for Dun Laoghaire's aspirations might well be Trieste on the Adriatic. In the glory days of the Austro-Hungarian Empire, Trieste was Vienna-on-Sea. The distance from the capital may have been enormous by comparison with the short hop from Dublin out to Dun Laoghaire. But Emperors – even ancient Hapsburg ones – could move mountains and shorten apparent distance, and they could ensure that the distance to Trieste was no barrier to the place having a Viennese atmosphere, style and sense of place. Those who find such an idea crazy might like to remember that your man Von Trapp, he of Sound of Music fame, was in real life an officer in the post–imperial Austrian Navy. Trieste was for real. So in a sense if we wanted to see what Dun Laoghaire in its burgeoning Kingstown days was trying to become, just think of it as Official & Ceremonial Dublin-on-Sea. Thus the buildings tried to be slightly miniaturised versions of impressive buildings of government in the city itself, and for a while they succeeded. The Town Hall, for instance, is a delight – to me it speaks as a restrained exercise in Italianate Victorian, and were it facing onto a proper town square, we really would have a space to celebrate. And just along from it in the town in its glory days was the unsullied façade of the Royal Marine Hotel. French chateau, I would say, and all the better for it. But another enjoyer of architecture was suggesting the other night that there was more than a hint of the south German schloss in it, so we agreed that it was either French or German depending on which country had won the most recent little war over Alsace and Lorraine. Whatever, the Dun Laoghaire waterfront at the height of the late Victorian-Edwardian era really was quite something. There were several different styles of architecture, but mostly they were good examples of their type, and all respected each other. It had a sense of completeness which harmonised with the harbour. But since then we seem to have lost the plot. Is there an element of disliking the built symbols of the past, and therefore sticking up something which is effectively a deliberate affront? Perhaps it's just that architects are scared stiff of being accused of producing new buildings, or extensions to buildings, which are merely pastiches of what went before, despite the fact that the general public seem more than happy with a good pastiche. And surely it's better to have a good pastiche than a bad bit of pseudo-modern design which clashes with everything about it? Thus the harmonious Dun Laoghaire waterfront of a century ago, as seen from within the harbour or down the piers, is now giving out conflicting messages which dampen the sense of welcome for those entering the port. The stately Royal Marine Hotel, a bit pretentious in its day perhaps, but nevertheless true to itself, was given an addition on its western side which, unusually, still hasn't mellowed in – it continues to look like a bad example of architecture from a particularly poor period. As for that wonderful Town Hall, the office block added down one side is better than the addition to the Royal Marine, but it has lost the opportunity to make a statement of harmony on the building's north side facing across to the railway station. And as for what could have been a town square in front of the Town Hall (for which we argued in favour in several issues of Afloat magazine a very long time ago) that was filled with the Pavilion Development which, while built with quality materials, has never seemed to quite know what it is supposed to be doing. You could scarcely claim it to be a runaway commercial success, and as ever in Dublin, it was the residential part of the project which provided the real motor for the exercise. But those residential blocks in turn intruded on the vital miniature parkland and garden in front of the Royal Marine Hotel. Now that glorious sea view from the Royal Marine is being further impaired by the new library. In fact, "impaired" is scarcely the word. The Royal Marine doesn't really have a sea view any more at all, in the sense that rooms at the front had a view clear out into the open waters of St George's Channel. Strictly speaking, all that the Royal Marine can now look forward to is a harbour and bay view, which is rather different. Much better than many Dublin hotels, perhaps, but a poor thing by comparison with the wide nautical vistas of the past. As for this new library, doubtless in the architectural trade it will be seen as an impressive use of new materials, and it will be pointed out how skilfully it has been fitted into a narrow space. But the computer-generated impressions of the finished building show something a little too like a Belfast peace wall to bring joy to the heart, and on its east side – the hidden side looming over many residential properties – they seem to be utilising rather a lot of nasty red brick, something which is otherwise almost entirely unused anywhere else on the Dun Laoghaire waterfront. But while the new library may seem to roar at its neighbours and loom threateningly over them, not every new development along the Dun Laoghaire waterfront provokes hostility. For instance, the new Irish lights headquarters is so good of its type that it greatly enhances the area. And as for the Ferry Terminal, "reasonably good of its sort" might be the kindest response. Something had to be provided to give a positive architectural response to the very new-style HSS ferries, and when there's one in port it's sometimes difficult to tell where ship ends and ferry terminal begins, which is as it should be. But the era of very high speed ferries may be drawing to a close, as the shipping companies gravitate towards a new generation of ships which may not be so utterly fast, but are much quicker than the boats the HSS replaced, and provide a level of on-board comfort which makes the little extra time aboard slip easily by. With economy measures now totally dominant, the lower berthing prices and much greater available berthing options offered by Dublin Port offset the fact the driving through the hinterland of the Port to the ferry terminals is not really a joyous urban experience. Most car-ferry passengers are prepared to tolerate a level of urban and sub-industrial blight in order to get cheap fares and frequency of service. But where the ferries move away as they appear to be doing from Dun Laoghaire, it seems the cruise liners want to move in. The cruise liners currently can berth alongside in Dublin Port, but have to lie off in Dublin Bay if they want to send their passengers directly by tender into Dun Laoghaire. But for the cruise liners and their guests, the prospect of Dun Laoghaire becoming a proper cruise liner port is positively mouth-watering. For when it fulfils its potential, Dun Laoghaire is a place of style and fun, an ideal up-market cruise liner destination. Simply being there in a luxurious cruise liner would be enough in itself on a sunny day with the harbour and waterfront alive with people enjoying themselves. And the ready access to Dublin itself, and the Garden of Ireland in Wicklow, is all a bonus. But such perfection won't come cheap. For sure, if it comes to fruition the Dun Laoghaire Harbour Masterplan of two years ago, indicating a large cruise liner berth to the west of the present ferry terminal, would indeed provide the Harbour Company with a golden source of income. But whether that income can be transferred onwards to traders in the town is another matter. The initial plan of two years ago for a Cruise Liner berth within Dun Laoghaire Harbour. While it will restrict some sailing and boating space within the harboiur, new space will be created by the removal of the moorings in the East Pier bight. Note the proposed swimming pool indicated at the time at right angles to the East Pier off the National YC (bottom right) with marina berths within a new breakwater. Cruise liner passengers are notorious for seeking complete packages beforehand. 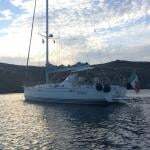 Thus when they arrive in port they expect shore visits to be part of the deal, and they prefer to move in pre-paid groups ashore, rather than move individually and spend some money in the town. So those who would expect across-the-board benefit may be disappointed. They may find that the cruise liner seen as the goose that lays the golden does indeed squat down, almost taking over the entire harbour, and it does indeed lay a golden egg. But that golden egg is only a fat berthing fee for the harbour company and hire fees for some bus company. Beyond that, expenditure can very limited. Yet there's no denying the real money that be made out of berthing fees, and that of course will percolate into the town in the form of wages for extra waterfront staff. Who knows, they may even have to find a crew for a designated Dun Laoghaire harbour tug or two, though a state-of-the-art cruise liner is computer controlled by a single joystick activating thrusters working every which way, and it's amazing the spaces they can access without tugboat aid. That said, in the event of a rare summertime nor'east gale, you could sell tickets for the end of the pier to watch a giant liner getting out. But this is all way in the future, though with every step in the economic recovery, that future is accelerating in its approach. For the moment, we can be sure that markers are being put down for future harbour use, and the word is that all the swinging moorings in the east bight of the harbour are going to be cleared, presumably to allow eventual manoeuvring space within that part of the harbour for liners. As that space will be empty when no liner is moving, its possible availability will partly compensate for the inevitable loss of sailing and boating space within the harbour, which is a proper concern of Water Wag sailors, inshore rowing clubs, and the increasing number of sailing schools. A newer line on the grapevine has it that one of the yacht clubs outside the current marina, currently concerned about members losing those mooring in the eastern bight, has negotiated exclusive rights for its members to the stand-alone marina pontoons in the northwest part of the harbour inside the northern marina breakwater, those berths to be accessed by a regular ferry service from the club in question. While seeing the logic of this, it would put paid to a crazy little notion of mine. Until this new allocation arose, it had seemed to me that there was potential for a completely new club, with its headquarters way down the West Pier where it meets outer marina breakwater. This new club would have its own direct access to that northwest part of the marina. The wild West Pier – which some would like to se as a kind of nature reserve – has ample room for both a roadway to this new clubhouse, and the existing walkway right out to the lighthouse. 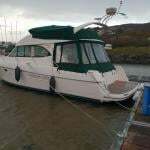 It would be one of the few clubs in Ireland to be south-facing, and its location would certainly provide that sense of being away from it all which is supposed to be what going sailing is all about. But that little daydream is now gone with the likelihood of a rapid ferry service from a club to the northwest Marina pontoons. Meanwhile, back in the real world, what is happening to preserve or destroy Dun Laoghaire's unique ambience which will, it's hoped, encourage Cruise Liner Companies to fork out mega-bucks to berth there? If you look carefully at the Masterplan, you'll see that in front of the National YC there's a blue pool indicated at right angles to the East Pier. At the time, this was envisaged as a swimming pool and lido area in a vast barge, and it seemed a reasonable idea, as within it there were indicated new marina berths within convenient reach of the club. But a recent planning application by the Harbour Company has put a different spin on all this. The new "urban beach" will be on a floating structure paralleling the East Pier alongside that handy berthing area on the East Pier. A cost of €2.5 million is being quoted as the capital expenditure needed to create this new facility, and the spokesmen for the harbour company are confident it will attract enough high-paying customers to pay off the initial cost while covering the significant running costs. That's as may be, but this large intrusion into valuable berthing space is also a matter of concern for those who have been campaigning long and hard for the restoration of the nearby disused Dun Laoghaire Baths, which are outside the harbour area and therefore wouldn't reduce any valuable berthing space. But in any case they're in a deplorable state of dilapidation, a danger and an eyesore, so some action is urgently needed. There's a Public Meeting on today (Saturday January 25th) about all this in the Kingston Hotel in Dun Laoghaire at 3.0pm, and it will be interesting to hear what people think about the old baths in relation to the proposed new urban beach. We move along the waterfront to the Pavilion, and the former Forty Foot pub. It's as near as certain going to be the Dublin area's first J D Wetherspoon pub. You'll have heard of them as the people in England who already have a chain of 900 pubs, and have just opened the first ever pub at motorway service area, which one would have thought unthinkable, but such seems to be the case. Anyway, big chief Tim Martin and his efficient team running this outfit have decided the time is now ripe to move into Ireland with its many post-Tiger era bankrupted bars. And they make no secret of their intentions. Their ideal location, they say, is large premises in a strongly working class area. Good for them, you say, but who on earth reckons Dun Laoghaire to be a strongly working class area? Well, 900 successful pubs across England can't be wrong. And it could well be what the Pavilion needs to come to life, even if it's not quite what posh passengers on a cruise liner might expect. But as for resentment that an English pub chain is moving into Ireland, the reality is that your favourite local, after a tricky time emerging from the aftermath of the boom years, is now probably owned by a German bank anyway. Concluding with our third opening point, the proposed new halting site towards the West Pier is a tricky one. That corner of the harbour has a small long-established site, presumably the new one will be much bigger. And things are already very crowded down there with the Dun Laoghaire Motor Yacht Club on the sea side of the little quayside street, and the premises of the Irish National Sailing School, the Irish Coastguard and others across the narrow road. The business of Traveller Halting Sites is a difficult one, but doubtless Dun Laoghaire can cope in its own way. After all, the harbour area already has several locations which look after the needs of people who have immediate access to unexpectedly large sums of ready money, people who also have a strange taste for drinking alcohol in the open air even when the weather is atrocious, people moreover who enjoy moving about all the time in uncomfortably confined damp spaces in close proximity with like-minded ruddy-faced folk. It's just that they're not called Halting Sites. They're called Yacht Clubs. Dun Laoghaire Harbour Company CEO Gerry Dunne responds to this article here.